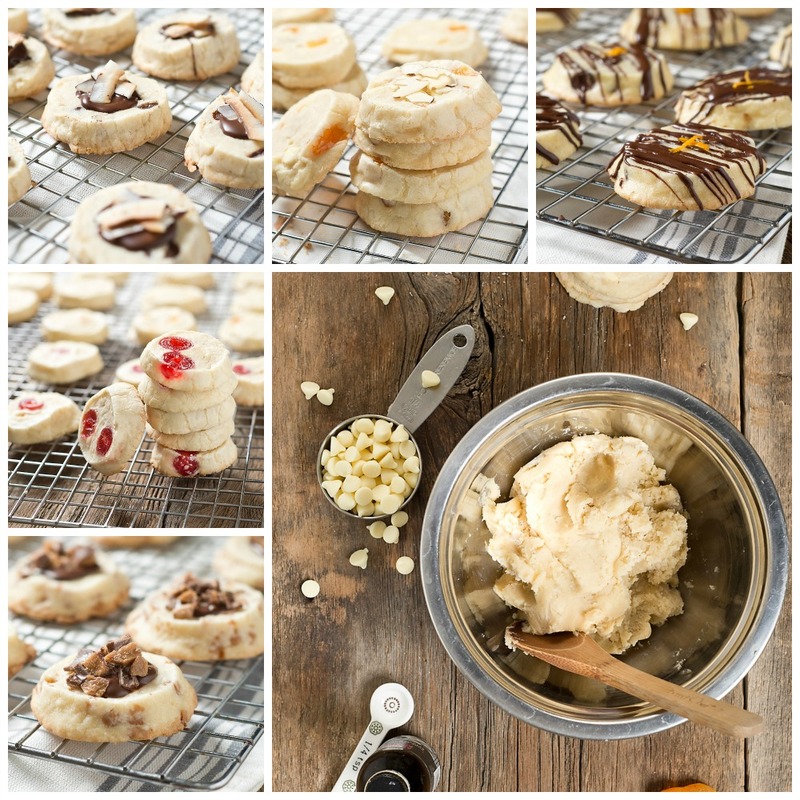 With the holidays fast approaching, Icebox Shortbread Cookies are the best kept secret for busy bakers. 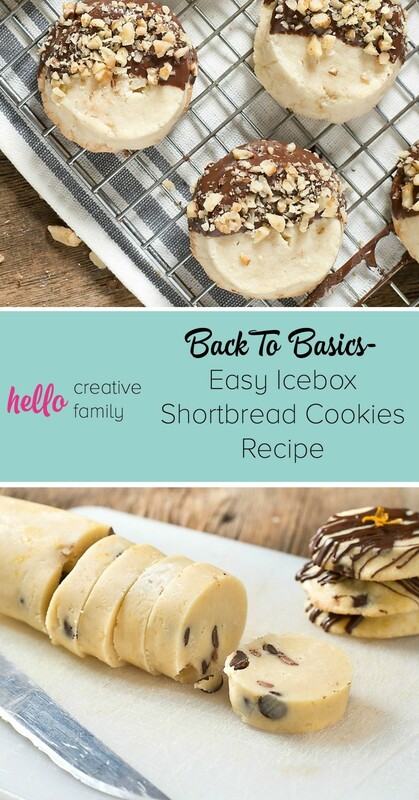 An oldie but a goodie recipe, also known as Slice and Bake Cookies, or Refrigerator Cookies, these rich, buttery treats are simply not given the props they’re due. Made with simple kitchen ingredients, the dough is mixed, formed into a log and refrigerated, and then sliced and baked when needed. The dough is easily customized, and freezes well both before baking and after! The rich, buttery taste is exceptional and the convenience is unmatched. 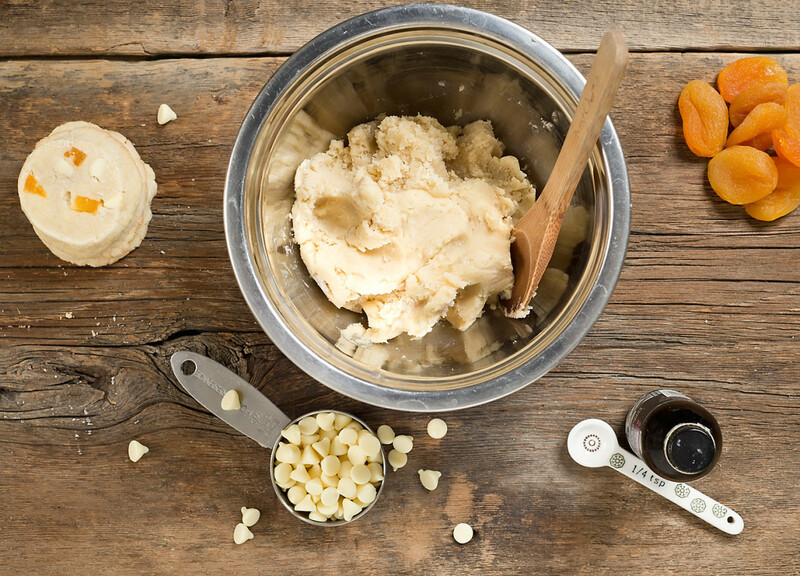 Warm cookies are mere moments away and there’s a flavor combination to please everybody! I always have a batch ready to go in my freezer. As a former bake shop owner, these were a must around the holidays for me. The dough itself is so versatile, that I’ve been making 4 flavors out of one large batch for a long time. They are just as outstanding plain as they are with the additions of dried fruits, flavor extracts, nuts and chocolate. Roll them in nuts or sanding sugar before baking, or dip them in melted chocolate and garnish after. You simply can’t go wrong! Traditional Shortbread Cookies do not include eggs in the ingredient list, but rolled or refrigerated shortbread sometimes do. I prefer the addition of eggs for a richer tasting cookie with a smoother texture. You can leave out the eggs if needed. Use good quality butter here too, unsalted is best. Read on for my recipe! 1. Preheat oven to 350F. In a large bowl, beat the butter until it is smooth. Add the confectioners sugar and beat again until fully combined and smooth again. Add the salt, yolks and vanilla. Mix well. Add the flour and mix just until combined. 2. Turn the dough out on the counter and divide into four even pieces, and place each quarter in a small bowl. Add mix-ins as desired to each quarter. 3. Turn one quarter out onto the counter that has been lightly dusted with confectioners sugar. Roll the dough into a sausage about 2 inches in diameter. For bakery style sizes, roll into a fatter log. Do the same with the remaining dough. 4. Wrap each log in plastic wrap and refrigerate for at least 2 hours or overnight. Once chilled, unwrap a log, roll it in any nuts or coatings, and slice it into rounds approx. 1/2 inch thick. Place cookies about 1 inch apart, on a sheet lined with parchment, and bake for 12-14 minutes. Allow cookies to rest for 2 minutes before moving to a cooling rack. 5. Melt the chocolate chips and shortening in a microwave safe dish. Stir until smooth. 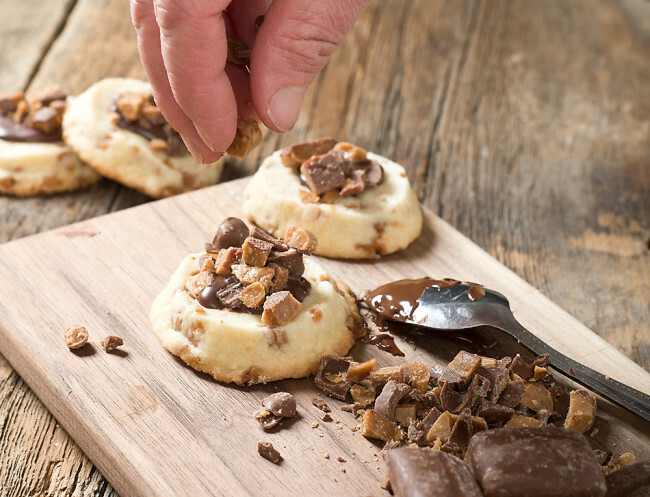 Garnish cookies with melted chocolate and chopped nuts, chopped chocolate bars, or coconut if desired. Preheat oven to 350F. In a large bowl, beat the butter until it is smooth. Add the confectioners sugar and beat again until fully combined and smooth again. Add the salt, yolks and vanilla. Mix well. Add the flour and mix just until combined. Turn the dough out on the counter and divide into four even pieces, and place each quarter in a small bowl. Add mix-ins as desired to each quarter. Turn one quarter out onto the counter that has been lightly dusted with confectioners sugar. Roll the dough into a sausage about 2 inches in diameter. For bakery style sizes, roll into a fatter log. Do the same with the remaining dough. Wrap each log in plastic wrap and refrigerate for at least 2 hours or overnight. Once chilled, unwrap a log, roll it in any nuts or coatings, and slice it into rounds approx. 1/2 inch thick. Place cookies about 1 inch apart, on a sheet lined with parchment, and bake for 12-14 minutes. Allow cookies to rest for 2 minutes before moving to a cooling rack. Melt the chocolate chips and shortening in a microwave safe dish. Stir until smooth. Garnish cookies with melted chocolate and chopped nuts, chopped chocolate bars, or coconut if desired. Add these optional extra ingredients! Want more sweet treat recipes that are perfect for holiday entertaining? Make sure to swing by my site, Sweet Revelations for more of my delicious baked good recipes. Do you have a great idea for a flavor combination? Tell us about it! You mention keeping a batch on hand in the freezer- how long would it keep? These cookies will last for a month in the freezer with no compromise to taste! Happy baking! Yum! I might do this for our holiday gathering! Love this recipie. It was absolutely Delish!!! Going to try this recipe tonight to take to a family Christmas party tomorrow! Thank you so much! These look so delicious… I’m going to have to try them! The toffee bits put them over the top! These look delicious! Can’t wait to try out the recipe! Pinning this. 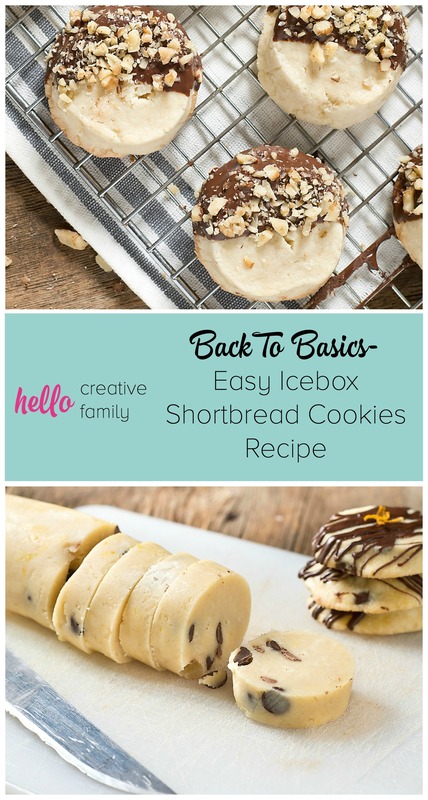 I’ve never tried ice box cookies and I absolutely love shortbread. Visiting from Welcome Home Wednesday party. These sounds amazing! What do you think about adding walnuts to it? Adding walnuts sounds delicious to me! If you try it, let us know how it turns out!